- Lattice type plants that produce runners. They are more sensitive to their environment and will require more specialization for plant propagation. - Hardy plants that fit just about anywhere in the aquarium. They can be propagated with cuttings. Aquarium plants make a beautiful well balanced fresh water fish tank, as well as a natural home for happy freshwater fish! Quite simply, aquarium plants will make your tank healthier, more stable, and more beautiful. The benefits to aquarium stability and balance are numerous. Water plants produce oxygen through a process called photosynthesis, they absorb carbon dioxide, and they breakdown waste materials. Adding plants to your aquarium is one of the best things you can do for a stable fish tank. Increase your enjoyment! A planted aquarium means better displayed fish! Aquascaping your aquarium gives makes fish happy and healthy. Many tropical fish are native to a world that includes aquatic plants. Live aquarium plants serve as food for aquatic life and also provide fish and fish fry places for retreat. Your fish will behave more naturally, display better finnage and courtship behaviors, and have more intense coloring. Best of all, by using water plants you create a unique aquarium design! 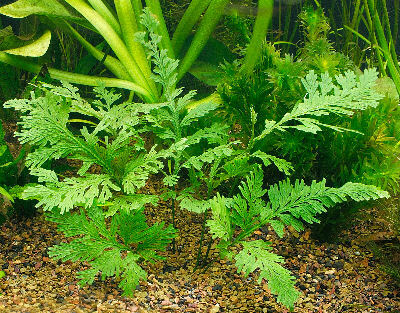 Selecting aquarium plants for the aquascape aquarium is not only fun, but is educational too. You can learn about the types of aquatic plants, the parts of a plant, and plant growth. The types of plants used in an aquarium consist of aquatic plants, amphibious plants, and land plants. Here we have divided the types of plants into three groups; ferns and mosses which are the non-flowering plants, rosette plants, and stem plants, both of which are types of flowering plants. All the types of aquatic plants can be used in the aquarium design. Getting started begins with planning your aquarium aquascape then selecting aquarium plants. Ferns and Mosses: Fern, Moss, and Liverwort plants are non-flowering plants which propagate by microscopic spores. Ferns also propagated partly vegetatively, often producing roots from rhizomes that can attach to rocks or wood ornaments in the aquarium making them easy to be propagated by the aquarist. Rosette Plants: Rosettes, beautiful leafy flowering plants, are the ornamental plants of the aquarium. They are spectacular used in groups or alone as a focal point in the aquarium design, but need a bit more specialized plant care. Stem Plants: Stem plants are a diverse group of flowering plants that can be used almost anywhere in the aquarium design. These are some of the most popular aquarium plants. They have good plant growth and are fairly easy to propagate with simple cuttings. Setting up a planted aquarium is similar to setting up a fish only tank. Like the fish tank, the planted aquarium will need lighting, heating and filtration. But it will also need a planting medium, or substrate. Once your tank is set up and you have it planted, you will need to provide plant food, usually a tablet or liquid fertilizer. Ongoing plant care will include water maintenance and keeping an eye out for anything hurting your plants like aquarium snails and other browsers, or plant diseases. With a good aquarium design and plant care, you will be rewarded with a lush, beautiful, well balanced aquarium which can soon be followed with plant propagation.